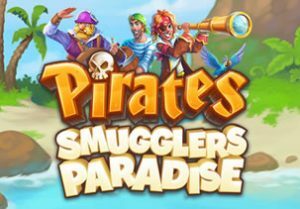 Set sail with a crew of cut throats in Pirates - Smugglers Paradise, a cluster pays slot game from Yggdrasil Gaming. The action in this well-designed game takes place on a 5x5 grid. Look out for symbol drops with expanding multipliers of up to 10x as well as 3 free spins features. Play on all device from between 20p and £100 per spin. As usual for an Yggdrasil Gaming title, the design in Pirates - Smugglers Paradise is very high end. Set against a secluded tropical seafront, the symbols appear on the sail of a pirate ship. You’ll see heart, diamond, club and spade symbols as well as bottles of grog, pistols, the ship’s captain, a hook hand and cutlasses. It all looks terrific. Winning combinations are created by landing clusters of 6 or more matching symbols. Rather than the winning symbols blasting away which is usually what happens with a symbol drop game, it’s the losing symbols that are removed. The winning symbols drop down and new symbols join them. These drops keep on coming as long as a new winning combo is created. The payout is then made. This is known as the Dropdown Wins feature. If you land 2 or more winning clusters on the same spin, the lower value symbol transforms into the higher paying one. If you manage to fill a whole row with the same symbol, you’ll be in for a multiplier boost via the Multiplier feature. Fill 2, 3, 4 or 5 rows and the payout increases by 2x, 3x, 5x or 10x. The multiplier is reset with a new spin. High Seas Free Spins feature - all of the lower paying playing card suit symbols are removed from play here. Multiplier Madness Free Spins feature - the multipliers here don’t reset at the end of a symbol drop. Instead, they increase for the duration of the feature up to 10x. Win Fall Free Spins feature - 2 winning symbols are added to the reels at the start of each symbol drop. We’ve seen plenty of pirate-themed games and a huge selection of symbol drop slot games. Not many come together as well as Pirates - Smugglers Paradise though. The visuals are terrific and the freezing winning symbols on the symbol drops offers something a little different. Add the multipliers and the selection of free spin rounds into that mix and were more than happy to join the pirates here. Medium variance, you can win up to 1,243 times your stake on each 10x multiplier spin/free spin. If you like the pirate theme and want bigger wins, Wild Seas from ELK Studios and Red Lady from Novomatic fit the bill. Reviews – All Rights Reserved.